After last weekend’s double disaster, including the loss of their Ramsbottom Cup title, Ribblesdale Wanderers returned to winning ways against Great Harwood on Saturday. Professional Ryan Canning made 50 and John Rain 80 out of Wanderers’ 184 – the only batsmen to reach double figures. Harwood paid man Joe Hawke returned figures of 6-38. 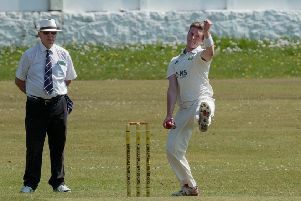 In reply, Patrick Swanney compiled an unbeaten 50 but Harwood fell 25 runs short of their victory target, as Jordan Britcliffe took 4-31 off 12 overs, and Ian Britcliffe and Jake Sunderland added two wickets apiece. On Saturday, Wanderers are at Cherry Tree in the league, and they are in LCB Cup action on Sunday when they host Prestwich at Church Meadow.